Bhakri means flat bread. All over India especially in the villages of rural India you will find, bhakri is a common man’s staple bread. It is not only a part of a traditional Indian meal but a traditional food of the farmers. Farmers always enjoy their bhakri with simple accompaniments like pitla (gram flour stew), garlic chutney & onions, mirchi thecha (a thick stir fried chutney prepared with green or red chillies along with ginger & garlic) or with rassa (thick curry/gravy of mutton or chicken). In the fields, the farmer uses the bhakri as a plate on which chutney, pickles, onions, thecha or vegetables are served & eaten together. 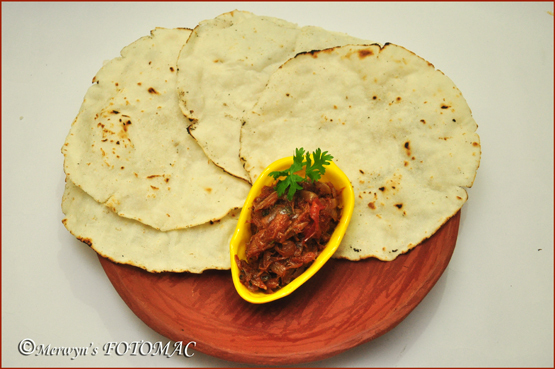 Bhakri is prepared with wheat, rice, jowar, bajra or ragi flour in different states of India. Tandalachi Bhakri which is made with rice flour is prepared mainly in Maharashtra, Goa, Konkan belt & other coastal areas in India, where rice is grown & consumed in abundance. 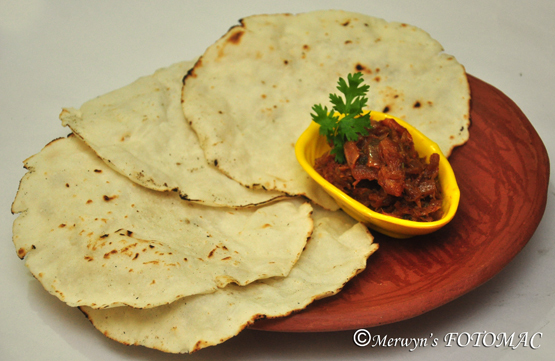 The tandalachi bhakri prepared in Goan homes usually has some fresh scraped coconut in it. It tastes very delicious with the inclusion of coconut. Bhakri is rich in proteins & fibre. It is nutritious & very easy to digest. It should be eaten hot, preferably straight from the tawa to enjoy its goodness & soft texture. Now, there are several restaurants in modern towns & cities who create a village set up & take pride in serving bhakri as a part of a traditional & rustic meal. Keeping alive the culture & tradition of rural Indian villages is the theme which is followed & promoted at quite a few wedding & party venues too. Many Indians are bringing back the traditional meals back to their dining tables & many have retained it in their homes for years. Boil water in a sufficiently large vessel. Once it comes to a rolling boil, reduce the heat to low. Add oil, rice flour & mix thoroughly with a spoon. Take it off the heat, cover with a lid & let it rest for about 5 mins. Then add scraped coconut, salt to taste & knead the mixture with your hands until the dough becomes very smooth. Add a little water & knead if the dough is too firm. Shape the dough into round balls depending on the size of bhakri you desire. Shape the bhakris using your hands on a rolling board or use a rolling pin. Use some dry flour for rolling. If using a rolling pin then roll the dough between two plastic sheets. Heat a griddle/tawa till hot. Gently lift & place the rolled disc on the tawa. Roast on med. flame. If the heat is too much adjust heat accordingly. Roast on both sides till cooked. Do not over roast or the bhakris will become too crisp. Place in a casserole or chapatti box. Keep covered to retain softness. Serve hot with bombil chilli fry (Bombay Duck) or with your favorite chill fry, curries, rassa, gravy, chutney or vegetables.